I cannot wait to spend more time relaxing! Having a place in NYC is exciting and tons of fun, but the vibrational input forces one to relax and take a break or you start to understand why honking is the national sport of NYC. Taking time in the summer to slow down is one of the keys to long term good health. 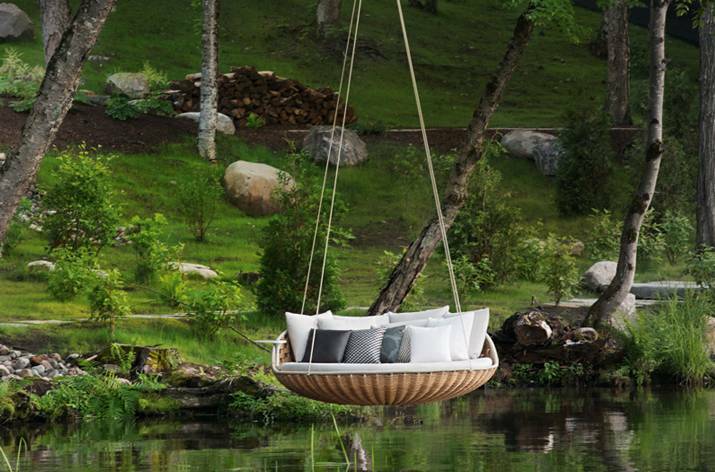 Take a look at this DEDON: SWINGREST; the perfect way to spend a summer night. Outdoor kitchens and living areas are popular in every climate now. There are many advances in fabrics that make just about any look you want available in an all weather fabric. One of my recent favorite textile collections are by Chris Barrett Design. Combine that with an outdoor kitchen and your house has increased its square footage with ease, comfort and room for your mind to relax. 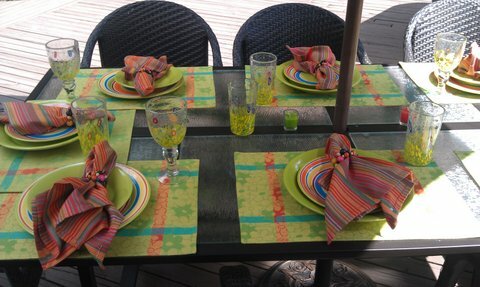 At my home I love to set the table in colors that will soothe my spirit and create a joyful ambience. I don’t have a pond to swing over, but I do have a hammock and I plan on using it soon! Happy, healthy summer. ~ by joanneriley on June 11, 2013.